Click here for a printable copy of Recipe Vegetarian Lasagna. Choose form these optional items: sliced black or green olives, bell peppers, any color, sliced mushrooms, steamed spinach, steamed green beans, steamed broccoli, sliced carrots, slice peppers (hot or sweet, depending on what you like). Tip: Lightly saute vegetables (except spinach) before including in layers of lasagna. (1) Preheat oven to 350 degrees. (2) Cook your pasta in boiling water for about 10 minutes until it is flexible, but not too soft. (3) Remove it from the water with a tongs and lay it out on your counter to keep it from sticking together and wrinkling in the pan. Don’t leave it in the hot water or it will be overcooked. (4) Pour some sauce to cover the bottom of a deep 10x13 (or equivalent) baking pan. (5) Place your first layer of noodles lengthwise, side-by-side in the pan on top of the sauce. Put enough sauce over the noodles to wet them without drowning them. Dot some ricotta cheese along each noodle. Top with some alternating slices of mozzarella, Colby, and Monterey Jack cheese. Add a layer of any of the optional ingredients, if you wish. Pour a bit more sauce over the layer and sprinkle with Parmesan cheese. (6) Place another layer of noodles, this time side-by-side across the width of the pan. You will need to cut them to size and you can use the extra piece to form part of the next row. (It’s okay to piece them together to form a row). (7) Put enough sauce over the noodles to wet them without drowning them. Dot some ricotta cheese along each noodle. Top with some alternating slices of mozzarella, Colby, and Monterey Jack cheese. Add a layer of any of the optional ingredients, if you wish. Pour a bit more sauce over the layer and sprinkle with Parmesan cheese. (8) Repeat this process, alternating the noodles in each layer until your pan is full or you run out of ingredients. The last layer should just have noodles, the rest of the sauce, a sprinkle of Parmesan cheese, and a sprinkle of parsley. (9) Cover with aluminum foil and bake for 30 minutes. Remove cover and bake for another 15-30 minutes or until lasagna is bubbling and top noodles are slightly browned. (10) Allow your lasagna to sit after it comes out of the oven for 15-20 minutes before cutting and serving. 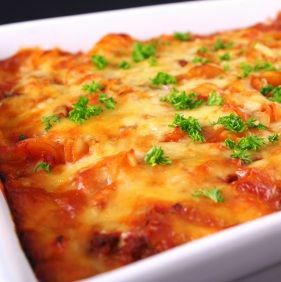 (11) This lasagna will freeze well and can be made ahead of time and then baked just before serving. *The advantage of using thinly sliced cheese instead of shredded cheese, is that it helps your lasagna to hold together. *Serve with a nice anti-pasto tray, crusty whole-wheat rolls, and a vegetable or green salad. Keep in mind that a little lasagna goes a long way and don’t overdo. Click here to go from Recipe Vegetarian Lasagna page to Whole Wheat Pasta page.